The Miracle Mile is a historic 1.5-mile famous commercial and museum district and convention hub. 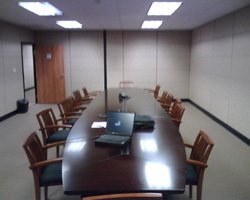 This TOA conference suite is located in the 27-story white building, conveniently located on a corner lot between Masselin and Hauser. This centrally located center is close to downtown Los Angeles, Hollywood, Beverly Hills and Century City. TOA will handle all your court reporting and deposition needs with excellence. We can provide full court reporting, interpreting, and video services, and our court reporters are state licensed, prompt and courteous. Our goal is your complete satisfaction!